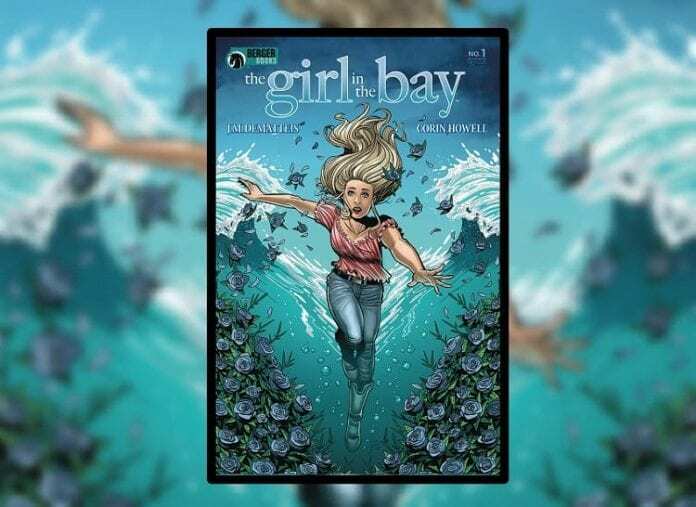 Coming from the Berger Books imprint of Dark Horse Comics, The Girl In The Bay is a mature readers comic that blends aspects of Birthright with The Crow. A brutal attack leads the central character on a journey beyond anything she could imagine as she is forced to face herself, literally, and seek revenge against the man who left her for dead. An Eisner Award winning writer, J.M. DeMatteis (The Amazing Spider-Man, Justice League Dark), has teamed with an excellent artist, Corin Howell (Ghostbusters: Answer the Call), to bring this new four-part dark adventure to the shelves. Magic, mayhem and murder, what more could you possibly want? The Girl In The Bay opens in 1969 with a young woman sinking into the depths of the Sheepshead bay, a trail of blood seeping out of her. Her name is Katherine Sartori and she is about to tell her story from beyond the grave but is she really dead or has something else happened to her? The early part of the story is set in the changing times of the late 1960’s and the writer, DeMatteis contrasts the turbulent world with the innocence of youth. Panels featuring the Manson Family sit above panels of teenagers chilling out in a cosy bedroom. DeMatteis first introduces the central character by showing the reader the horrible death that awaits her before leading us through the last day of her life. However, because the voice over is Katherine’s, the reader already knows that the scene from the first page isn’t the end of the story. Unless you assume a posthumous narrative ala American Beauty. DeMatteis introduces the characters that Katherine interacts with on a daily basis and depicts her life as that of a normal, albeit rebellious, 1960’s teenage girl. She is experimental, self-assured and comfortable with her life. Katherine is an independent and positive young woman which makes the betrayal of trust that leads to the attack on her even more upsetting. Just as the decade is emerging from playful innocence into darker times, so to Katherine’s youthful optimism is exploited by a cruel and merciless figure. There is a romanticism to the opening of this comic that is reflected through the poetic nature of Katherine’s inner monologue. This changes halfway through The Girl In The Bay when the story catches up with the opening page. The second half is shrouded in confusion and mystery. The voice over disappears for a while leaving the reader in the dark just like Katherine and when it returns it has a darker tone: there is an element of cynicism to it. DeMatteis wants the reader to be separated from their comfort zone just like Katherine is and the subtle change in the narrative voice ensures this. There is a darkness to the art work throughout The Girl In The Bay. Howell’s figures are very well defined. She uses delicate inked lines to form the characters and then heavy shadows to reflect emotional states. Often characters, especially Katherine, are cast in all consuming darkness sometimes foreshadowing the twists in the narrative and at other times highlighting despair or loneliness. Howell adds a lot of detail into the scenery. This helps to create a firm setting but also helps with the contrast between the 1960’s and the present day. It is clear that the landscape has changed, again illustrating the move from innocence to experience; that classic poetic discourse made famous by the likes of William Blake. More contrasts can be seen in the color work of James Devlin. There are some subtle shifts in the color palettes, most notably when the romance element turns to violence where the soft pinks become harsh reds. But there are also starker color choices that set the tone for the page. A three-page sequence, for example, is made up of a page of soft, romantic colors, followed by a page of cold blue and finally the shift to a warmer aquamarine page. The narrative beats for these pages are expressed through the color choices; love followed by violence followed by an ethereal acceptance. In The Girl In The Bay Devlin displays a fine example of how to use color to enhance the emotional aspects of the narrative. Clem Robins also does a great job of visually expressing the emotional aspects of the narrative through the lettering. Although it is not as obvious as Devlin’s colors, Robins’ lettering picks up on moments of surprise and realisation in the dialogue and translates this into a visual element of the panels. A prime example of this is when Miss Horowitz, Katherine’s neighbour, thinks she recognises Katherine. Robins changes the font and the speech balloon to emphasise this recognition from one panel into the next by shifting from a smaller font in a small balloon to a bold font in much bigger balloon. Robins also gives Katherine her own typeface in the narration, differentiating this from everyone else in the comic. This makes the reader understand that the narration is separated from what they are seeing and acts like a voice over in a noir movie. The narrator has knowledge that the characters and the reader doesn’t have which means that you automatically take more notice of what is being said. Although this story may be building towards a ‘revenge from beyond the grave’ tale like The Crow, it is also a reflection on history and how the world has, or hasn’t, changed. The story opens on a turning point between ideologies; the innocence of the 60’s is about to disappear with the arrival of the 70’s. This change is reflected in Katherine as she is thrust from her home into the strange new world of the future. Although the narrative is very personal, it’s all about Katherine, the comparisons with the world as a whole are there. The World moves on, forgetting the tragedies of the past. Just like Miss Horowitz, the World has aged and become more disorganised. 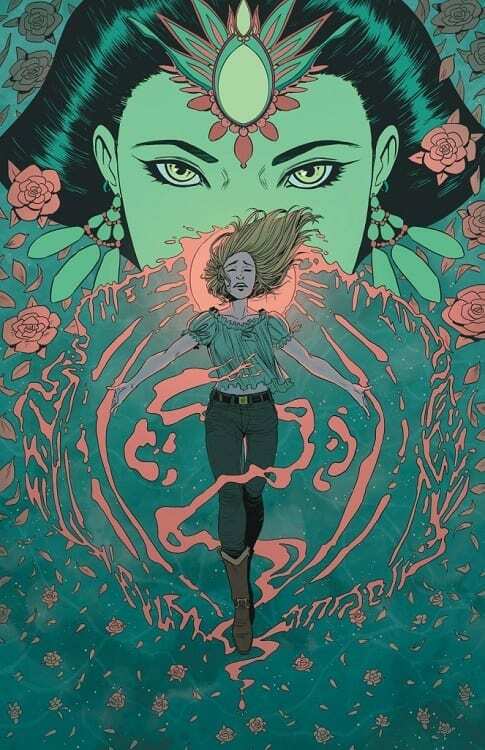 The Girl In The Bay is an intriguing read with a lyrical script and Art to match. The narrative flows through the panels and across the pages like the stanzas of a poem. Howell’s artwork is a beautiful accompaniment to DeMatteis’ dialogue. This is an excellent first issue and promises to be an exceptional series.